There is almost 700 years of documented history at Stubbers. The earliest document dates back to 1334, this was on the title deeds of the Land. The estate was named after the Yeoman farmer called William Stubbers – who lived here from 1438 to 1463. Before 1563 the land and house was owed by Cathemayde, a wealthy merchant and then Robert Warren. It was the Warren family who sold the estate for £320 to their brother-in-law Robert Coys. It is Roger Coys son William who the walled garden is accredited to, with his love and enthusiasm for plants. The estate was in the Coys Family from 1563 until William Coys died in May 1627. Sir William Russell bought it in 1689. In the 1800s a later William Russell enlisted the help of the notable landscape gardener Humphry Repton, who redesigned the walled gardens and the house – this was produced in the form of a Red Book. The last member of the Russell family lived in the house until they sold the estate to Essex County Council in 1947. The ownership was transferred to the Greater London Council in 1960 and then to the London Borough of Havering in 1965. The land was leased for 12 years where gravel was excavated and the pits filled to make the current lakes. The Local authority Activity centre was closed in 1995. 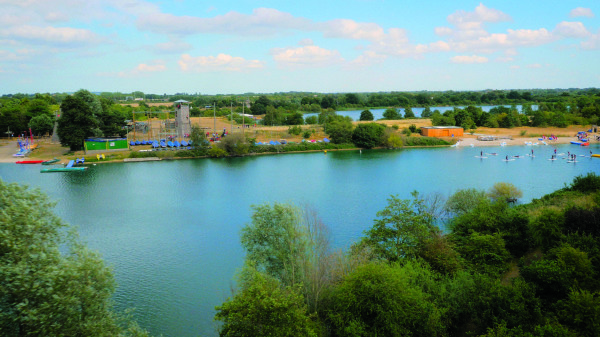 In April 1996 the current Stubbers Adventure Centre Ltd was opened. The land was acquired by Essex Boys and Girls Clubs on a peppercorn rent form LBH. The walled garden is credited to William Coy. It is noted that there were 6 walled garden on the estate. Which were filled with all kind of plants from all over the world which William Coys brought into the country. It was almost 100 years later when the gardens at Kew were started, that many of the plants were taken. It was here that Joseph Banks the unpaid director of Kew in 1772 continued the work of William Coys nearly 200 years after he started. William Coys had a unique collection of over 324 plants listed, of which were mainly gathered from abroad. These imported plants had never been grown in the country before. Visitors to the gardens were amazed to see such plants growing in his garden like the Yucca gloriosa, tomato, Rhubarb and the Jerusalem artichoke. William Russell enlisted the help of the notable landscape gardener Humphry Repton, who redesigned the walled gardens, this was produced in the form of a Red Book. The red book still exists today, but is reported to have some fire damage. The Garden which still stands has had repair to its walls after the great hurricane of the 1980s. Spending your life with the one you love is truly a gift to be treasured. 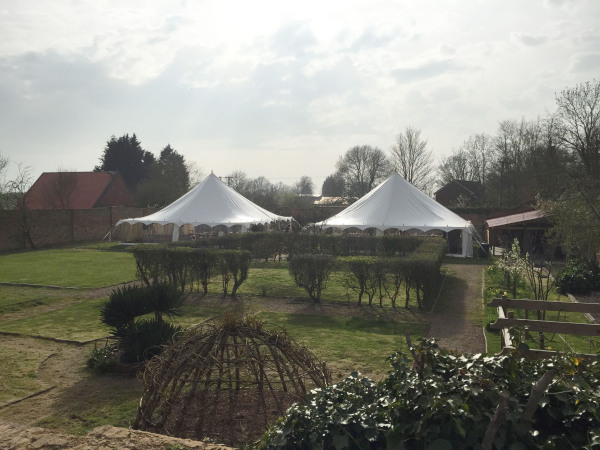 The wedding venue hire fee covers the rental of the 12 metre x 12 metre single pole marquee stood on its own patio and two additional 6m x 6m “ Chinese hat” pagodas. Also use of the garden, kitchen/bar/undercover area, WCs suitable for up to 150 guests, parking and parking marshals. For an additional fee there is the option for a second, matching, 12 metre x 12 metre marquee or 8.5m x 11m “Espree” shade which can be used as an extra cover option in the event of poor weather. Table drinks for the wedding breakfast may be provided by yourselves or caterers. A fully staffed and equipped pay bar is provided with payment options matched to your budget. Our excellent caterers can provide for a wide range of food options and budgets from BBQ to full on silver service. An easy to access pulley system is located on the central pole to enable you to dress the marquee as you please with bunting or other hanging decoration. Come the darkness the garden looks magical with the garden walls lit up and the marquee brought to life with festoon lighting and colour changing led uplighters. The Marquee and Walled Garden are available to hire from early May to early September. The Day / Evening event hire covers the rental of the marquee on its own patio, garden, undercover kitchen / bar/ area, WCs and parking. An easy to access pulley system is located on the central pole to enable you to dress the marquee as you please with bunting or other hanging decoration. Table drinks for a sit down meal may be provided by yourselves or caterers. Thereafter the bar will be provided by our approved licensee either as a pay bar or with drinks provided by yourself for which there is a charge. Come the darkness the garden looks magical with the walls lit up and the marquee brought to life with string lighting as standard. While we welcome family events we regret that we are unable to accept bookings where the majority of guests are young people (e.g. children’s parties,18th and 21st Parties). Please note that day and evening events dates are only open for bookings from January of the Year of the party.